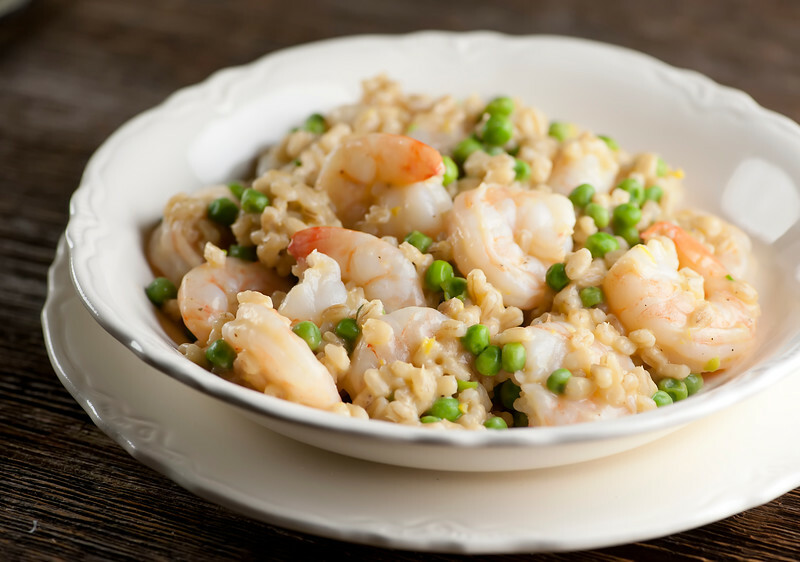 I know, you are sitting there thinking that risotto means rice, and technically that is true, but in this case this recipe for shrimp barley risotto with peas is an ode to one of my favorite grains. I love barley, and for the longest time my faithful bag of barley just sat around waiting for me to make my annual vat of slow cooker beef barley soup. And then one day I awakened and realized that barley could be used pretty much anywhere I was using rice. Even in risotto, which I am playing fast and loose with by saying that any grains you simmer slowly and lovingly in broth and then stir ingredients into near the end counts as risotto. Maybe in this case barley-otto? One way or the other, it involves tender shrimp and sweet peas and creamy parmesan and (say it with me now) BARLEY, and it is just plain scrumptious. Let’s make it! First of all, you want a bag of pearled barley. Pearled barley is simply barley with the outer husks removed, which means it cooks up more quickly, and it’s usually the barley you find in your supermarket. I’m sure you could use regular barley and just cook it longer, and if you do please let me know. I love knowing as much as possible about barley. You cook up the barley in a nice bath of chicken broth…you can either do it the authentic risotto way by adding small amounts at a time, or you can do what I do when I stagger in exhausted from work (hello last week!) and just add all the broth at once and let it simmer. I wish I could say I tasted the difference, but I don’t – both methods end up scrumptious. You want to cook the barley for about 30 minutes, until it has absorbed the broth and is still just a little bit chewy. At this point, add in some small peeled uncooked shrimp and a cup of thawed peas and stir it all around until the shrimp are pink and tender. This is going to take about 3 minutes or so. Now finish things off by stirring in some grated parmesan cheese and a little lemon juice and zest, and season it up with salt and pepper. And that’s all there is to it. I always serve up this particular dish in my grandmother’s dishes…I have two bowls and two plates, and they always take me right back to sitting at the table in her Vermont farmhouse kitchen. Which makes this particular comfort food dish that much more comforting. Delicious all the way around! Heat oil in medium saucepan over medium heat. Stir in barley. Add wine and cook, stirring, until liquid has evaporated. Add 1/2 cup stock and cook until liquid is absorbed, stirring occasionally. Continue adding stock 1/2 cup at a time, waiting until liquid is absorbed before adding more, until barley is tender but still slightly firm, 35-40 minutes. About 3 minutes before barley is done, stir in shrimp and peas. Cook until shrimp are just pink. Remove from heat and stir in lemon zest, lemon juice, and cheese. Taste and season as need with salt and pepper and serve. Hi Kate! You know, here in Italy too we sometimes use barley to make risotto and guess how we call it? Barley= “orzo” in italian, so the name is “orzotto”! As for the technique of pouring all the broth at once and not finding any difference at the end, you are right: I do the same everytime because I always use the pressure cooker to make risotto, it’s quicker and the result is perfect!???? Orzotto – I love it!! Perfect! Kate, this looks delicious. I’m going to make it with arborio rice because that’s what I have. Thanks for the recipe! Arborio rice is pretty wonderful too – hope you love it! I have that same mental block with barley where I pretty much use it for beef barley soup. I have to start thinking more creatively. It’s such a great grain, and this dish looks incredible! In all my romancing of farro lately I’ve been neglecting the barley…every time I make it I remember that it really is one of my faves! Count me in for this dish Kate! My whole family will love it! Risotto is a fave at our house! It’s like elegant comfort food, right? I love that you used barley in place of risotto, Kate! I’ve only used it in soup before, so this is such a great idea. My husband would go crazy for this dish, as he’s a huge shrimp lover! Such a perfect meal! I only ever used barley to make soup. I would love to cook this, it sounds delicious. Barley is pretty much wonderful for anything you would normally use rice for. I heart barley! Love the idea of using barley in a risotto! I need to try this. It deserves to be used in more dishes than just soups! It does!! Hurray for barley! I don’t use barley enough! I definitely need to, thanks for the inspiration! My pleasure – enjoy that barley! What a clever way to make risotto! Adding the shrimp and peas make a perfect meal! I have made barley risotto before and it totally counts as real risotto in my book. I’m a huge barley fan – that taste! that texture! – and this creamy shrimp and peas version looks so scrumptious. Makes me feel ready for spring! Pinned!